I am not Irish. Not one bit. But I have always been drawn to Irish things – books, music, movies, and authors. Last Labor Day weekend I talked my brother and sis-in-law into going to the Irish Fest downtown Rochester and we had a great time! We ate some Irish stew and drank some Irish whiskey and danced during an Irish caili! When I saw the Irish Style Table Trivia Night advertised this week, I knew that I wanted to go. I talked Kristine into going with me and then we decided we would just go and watch for a while and leave after about an hour. Well, that didn’t fly with the people in charge and we were cajoled into paying our $10 to start a table of four. They put us with two random guys (Dan and Don) and the fun commenced. There were about ten tables of four and five rounds of trivia to be played. The first round of ten questions was movie trivia – I thought I’d stand a chance at doing pretty well at this! But it was very difficult. He would name a year and three character names and we would have to figure out who the actor was that played that character and what movie those three actors were in together. For example (and probably remembered wrongly), 1993 movie starring Jason Bourne, Forrest Gump and someone else (who turned out to be Vin Diesel). We got this one right after I wondered aloud/quietly if there was a war movie with them in it – and it was Saving Private Ryan. Yay us! We ended up getting 5 points for this first round – a disappointing start compared to everyone else (except the team that got 0!). Round two was Arts & Literature and we did better at that round. I knew immediately that Frank McCourt wrote “Angela’s Ashes,” otherwise we worked together to come up with those answers. Round three was kind of a “gimme” – it was pictures and we had to identify either the movie or actor or famous person. We got them all right. Round four was the Cheese Round. 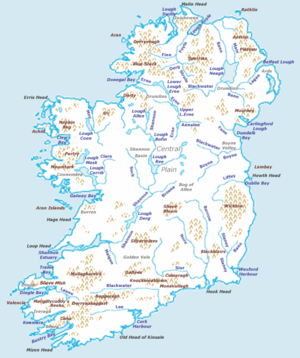 All questions relating to Ireland. Very difficult! But we ended up in a tie so we had to have a very very difficult tie-breaking round to see who would get all the cheeses! (It is like 14 wheels of cheese and four pounds of Irish butter!) We barely won that round, answering 4 correctly, when the other team answered 3! Yay us! Round Five was the “money” round, so we finally figured out that all the questions or answers had to do with money. By this time we were getting pretty competitive because we were close to winning it all and when you’re close you want the whole thing, right? If we had been in the middle we wouldn’t have been as intense. We did great at this round and ended up winning 1st prize! First prize was a bunch of things – a basket from Diamond Joe’s Casino, round trip tickets on Rochester Direct (to MSP), a fancy pen, and a weekend in Door County for two. It was hard to split that up, for sure, so we ended up rolling the dice in the Diamond Joe’s basket and high number won the Door County stay – Kristine rolled a 4 and Dan rolled a 2! Yay us! Oh, and Don is a psychiatrist at the Federal Medical Center and said they are looking for a social worker! I gave him my card and hope he emails me, because I don’t see the job posted on the Federal jobs site! But wouldn’t it be the luckiest night ever if a job came out of it??? I’m still on a little trivia high… wow! This entry was posted in Stuff About Me and tagged Celtic, cheese, Frank McCourt, fun fun, Irish, money round, table trivia night, Trivia. Bookmark the permalink.